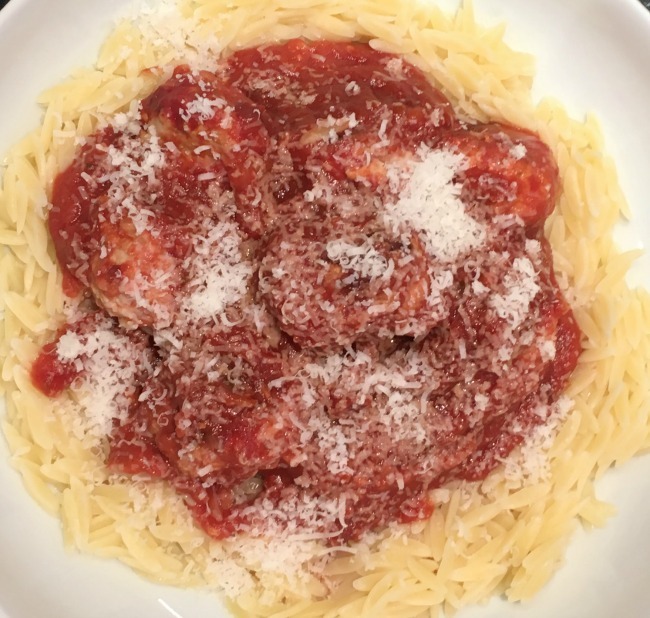 I love meatballs, I often make a version of Italian meatballs with lots of herbs but it contains breadcrumbs so I was really pleased to see a recipe in my Slimming World book that was Syn free. The recipe looked very complicated though with frying and grilling and lots of pans so I adapted it to go into the oven. The sauce is really rich and the meatballs very limey. Delicious and filling. Spray a non stick frying pan with fry light and fry the onion and garlic for about 5 minutes until softened. In an oven proof casserole dish pour the passata, the crumbled Oxo cube, half the Oregano and half the fried onion and garlic. Stir until well mixed. 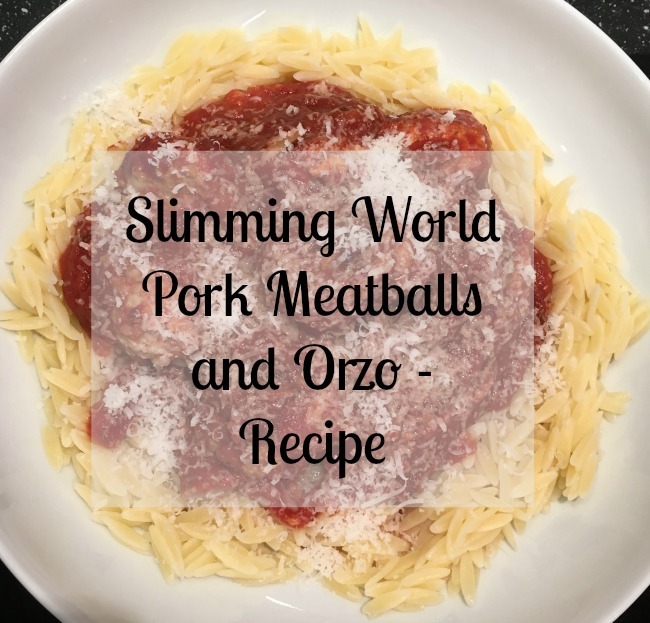 Put the pork into a bowl and add the chopped oregano, zest, half the chopped Oregano and the other half the fried onion and garlic. Using your hands mix really well and form into balls about the size of a golf ball (about an inch across). Fry the meatballs in the same pan, turning frequently. 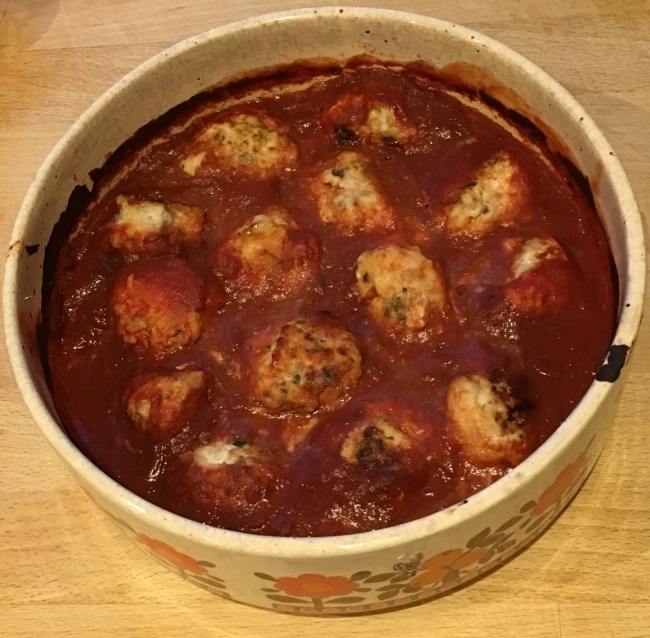 The meatballs are fragile and only need to be browned not cooked through. Don't over fill the pan, fry in batches and when browned gently place into the sauce in the casserole dish. Put the casserole dish into the oven and bake for 35 minutes without a lid so the sauce thickens. Serve with Orzo pasta or spaghetti. I like to make these in advance and reheat in the oven for 25 minutes as I think the flavours develop whilst resting. Serve with a sprinkle of grated parmesan. If using as healthy extra then this is Syn free, if not then add 2 Syns.